The monarch butterfly (Danaus plexippus) is one of the most well-known butterflies due to its beauty and large size. It has a wing span of nearly 4 inches (10 cm). It belongs to the family Nymphalidae. During the fall, monarch butterflies migrate to California and Mexico for the winter and return to the north during the spring. During this migration large groups or flocks of monarch butterlies can be seen together. Once they reach their winter destination they take shelter on trees. Unfortunately, the monarch butterfly's habitat is being destroyed by humans in Mexico and in the U.S. due to logging and urban land development. Even common milkweed that the monarch larva must have in order to survive is now in scarce supply. You can tell the difference between male and female monarchs because male monarchs have a black spot on both of their hind wings. Males also have thinner black veins on their wings than females do. 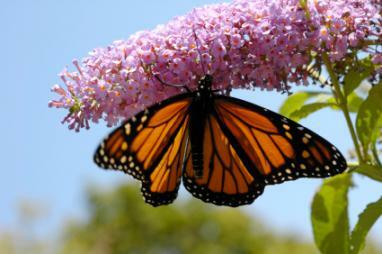 Monarchs are known as milkweed butterflies because they lay their eggs on milkweed plants. 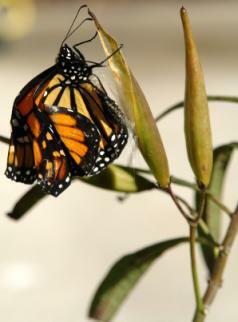 Female monarchs will wait until they find a milkweed plant to lay their eggs. Monarchs lay their eggs one at a time, but lay them many times a day. It is only a myth that female monarchs die after laying their eggs. Once the monarch eggs hatch (in about 2-3 days), the larva feeds on the leaves of the milkweed plant. In fact, most birds won't eat monarch butterflies for this reason - the milkweed that the monarch larva eats causes the adult butterflies to taste bad. 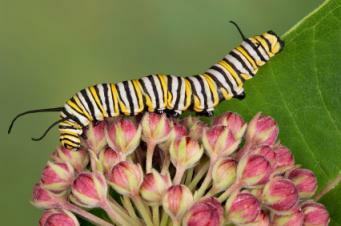 The monarch caterpillar eats until it is about 2 inches (5 cm) in length and then it forms a a chrysalis or pupa. During this stage the butterfly undergoes many changes. Once the butterfly is fully developed it emerges from the chrysalis. When it first emerges its wings are wet and the butterfly must wait several hours for them to dry. Once its wings are dry the butterfly will fly off in search of food. 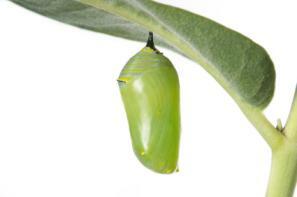 The whole developmental process from eggs to adult butterfly takes only about 30 days. Adult monarchs have a lifespan of about 6 weeks, but live somewhat longer when they are migrating. If you want to attract monarchs to your yard below you'll find a list of some of their favorite foods. Planting common milkweed in your yard is sure to bring monarchs and will provide their caterpillars with the nutrition they need.